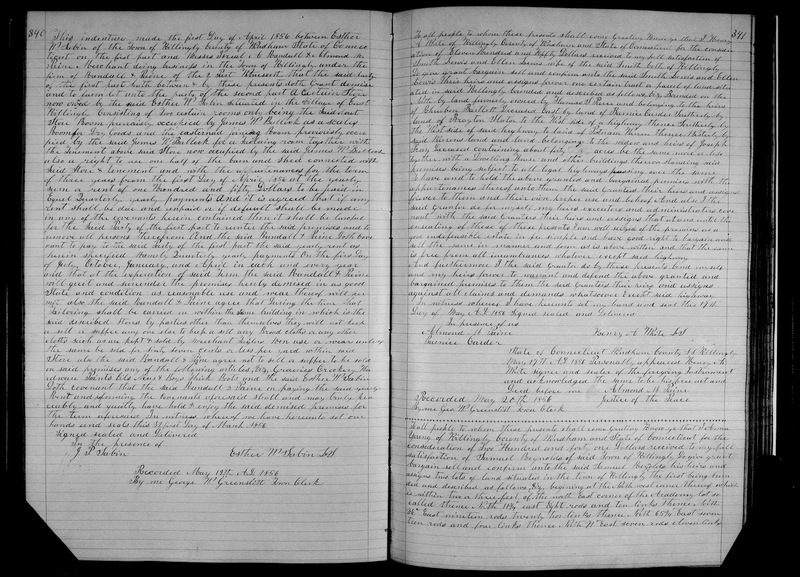 Genea-Musings: Amanuensis Monday - Post #437: 1856 Deed of Smith and Ellen Lewis to Henry A. 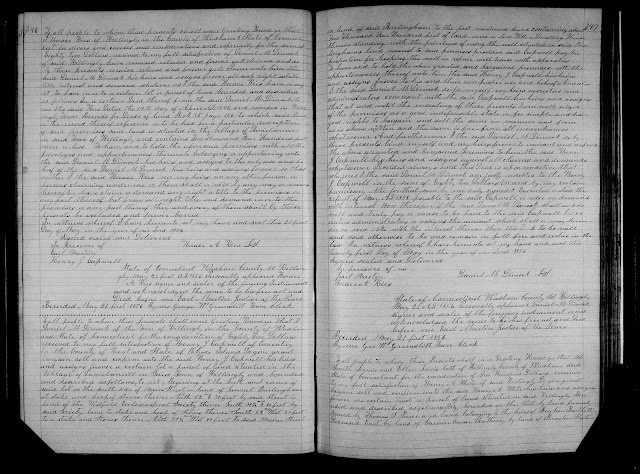 White in Killingly, Conn.
Amanuensis Monday - Post #437: 1856 Deed of Smith and Ellen Lewis to Henry A. White in Killingly, Conn.
a order for value received Two years from date thereof with interest annually. I have hereunto set our hands and seals this 17th Day of May A D 1856. By me Thos. J. Evans, Town Clerk. 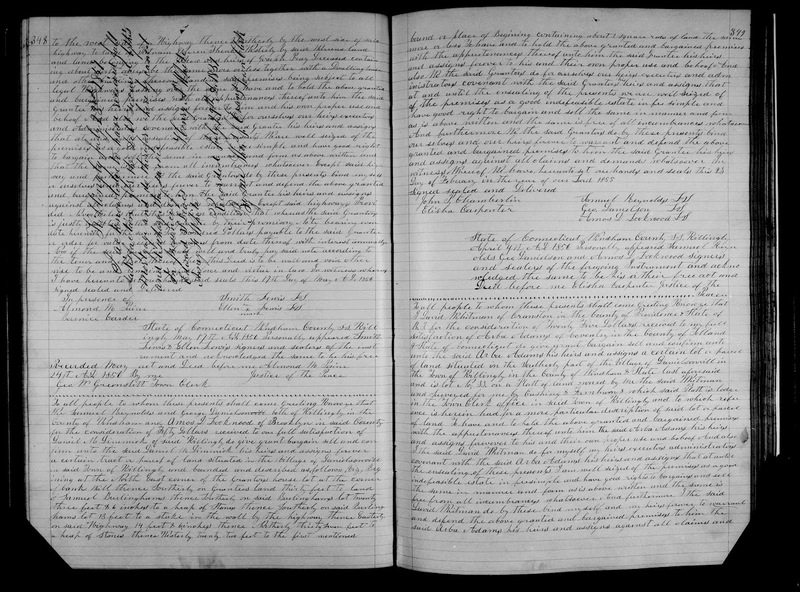 Killingly (Connecticut) Town Clerk, Land Records, 1709-1907; General Index, 1709-1908, "Land records, Vol. 37-39, 1850-1857," Volume 39, pages 347-348 (images 749-750 of 820), Smith and Ellen Lewis to Henry A. White, 17 May 1856, recorded 24 May 1856, accessed on Family History Library microfilm US/CAN 1,450,885; original records in Danielson, Conn. town hall. There are a number of deeds for my 2nd great-grandfather Henry A. 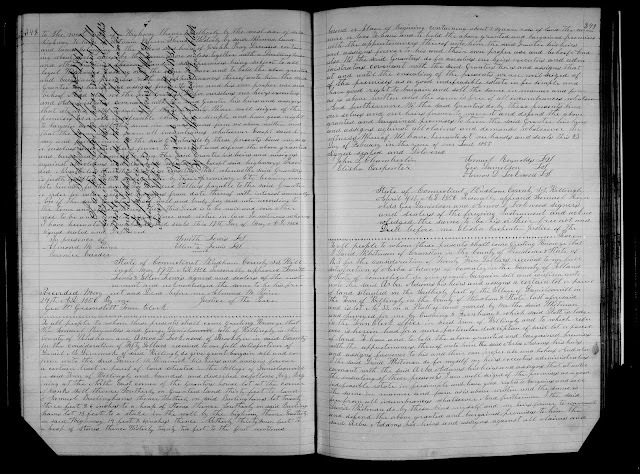 White (1824-1885) in the Killingly, Connecticut land records. These records are recorded in the Connecticut towns rather than in the county records. This is the sixth deed recorded in Killingly town records for Henry A. White. Smith and Ellen Lewis bought this land for $1,150 from Henry A. White on 17 May 1856 (see ) and with this deed became indebted to Henry A. White for $200 on the same date as the earlier deed. They paid off the debt on 23 July 1857. Henry Arnold White (1824-1885) was a son of Jonathan and Miranda (Wade) White of Killingly. He married Amy Frances Oatley (1826-1864) in 1844 in Thompson, Connecticut. Their daughter, Julia E. White (1848-1913), who married Thomas Richmond (1848-1917) is my great-grandmother.